Last year, we announced updates every other week and this year we want to keep the same pace. As a matter of fact, we just released a little update that will make the in-app navigation easier and faster. Let’s take a quick look and see how you can now switch between channels and shops. We have added a shop/channel switcher to the top bar navigation.The switcher is available on every page, and it redirects to the corresponding page in the selected shop or channel. On the pages connected to the shop (shop settings, shop products, channel's list, analytics) there is a shop switcher in the breadcrumbs. Let’s say you are editing the shop settings for one of your shops. If you switch to another shop you will be directed to the same corresponding page: shop settings. The pages related to the channel (mapping pages, channel settings, channel products) will also have a channel switcher. Let’s say you just updated your excluded products on one of the channels, and you want to do the same for the rest. If you choose another channel from the switcher you will be directly sent to the Exclude products tab on the other channel. We have moved around some of the icons in the app. The chat icon has stayed to the right, but is now more prominent and the Help Center icon moved to the left next to the language changer. Also, you can now attach screenshots directly from the chat window. This will make it easier for our support team to understand which problem you’re trying to solve and help you faster. The field search can now be found at the top of the channel or mapping pages. The field search allows you to find and navigate easier to any field in a given shopping channel. Just type in the field you are looking for, click on it and we will take you directly there without having to scroll down to find it. Small little updates that facilitate communication and help you be faster and more productive with your mappings. Thank you for all the feedback we get from you every day! We appreciate you helping us build a better product. 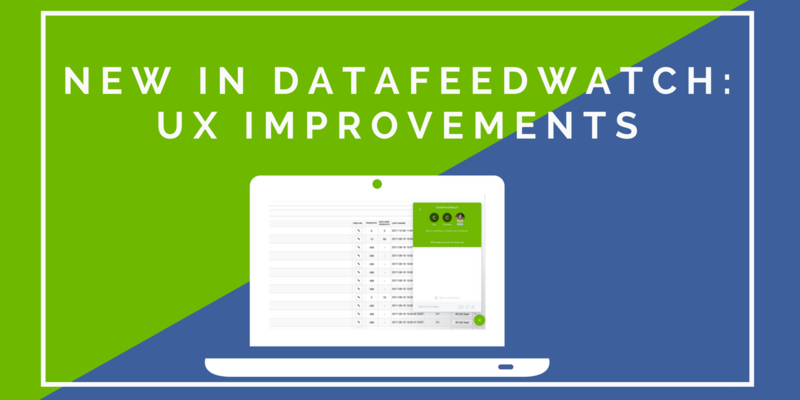 If you have suggestions to make DataFeedWatch better you can write us at any time at support@datafeedwatch.com.